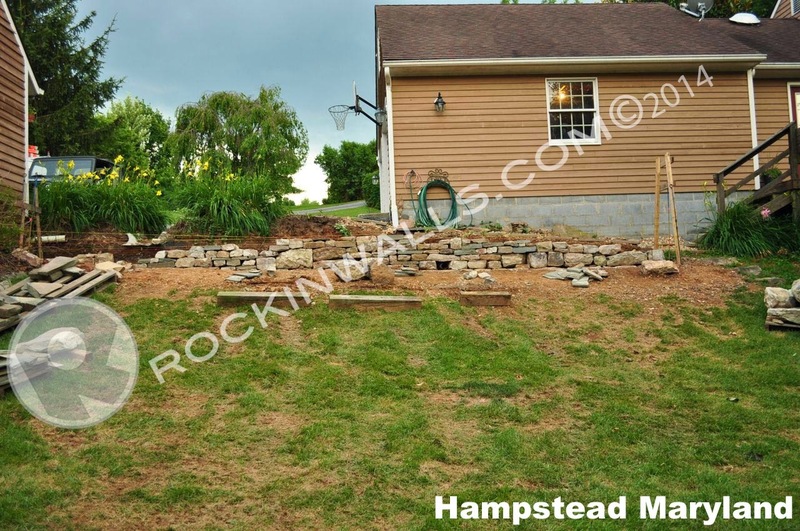 ROCKIN WALLS: The right stone for the right job ?? The right stone for the right job ?? Have you ever tried to cook with out following the receipt and using other ingredients? Having the correct ingredients is half the battle. When you bake a pie you always follow the receipt if your short on one ingredient say milk you don't add water. Nor would you add more milk then the receipt calls for . What does this have to do with stone? 99% of my stone projects are new builds. 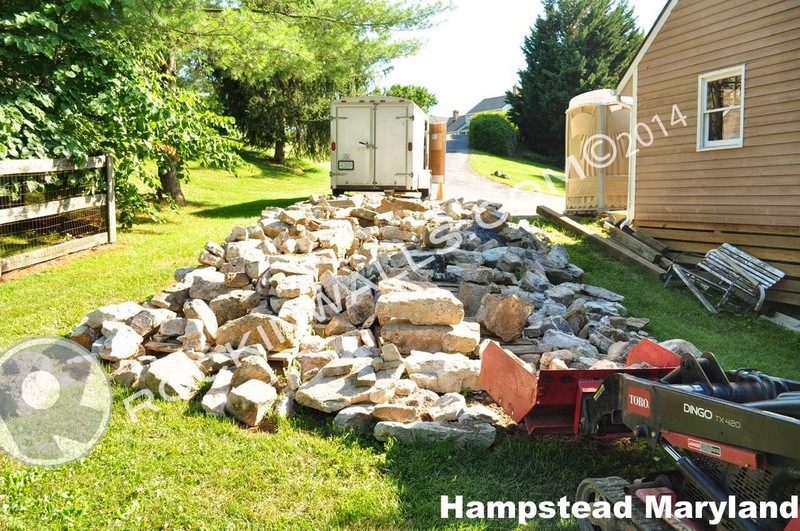 This home owner bought stone from out of the area from a listing on craigs list in Pennsylvania. 10 pallets of barn foundation stone to be exact now that would seem like a lot of stone?! Yes it is alot of stone as you can see. You might think this is good - some might think this is bad. The good is that someone else has hand picked these stones before to build a barn. The bad - most stones picked for mortared projects tend to have long faces as called Tracing stones if used for dry laid stone construction. 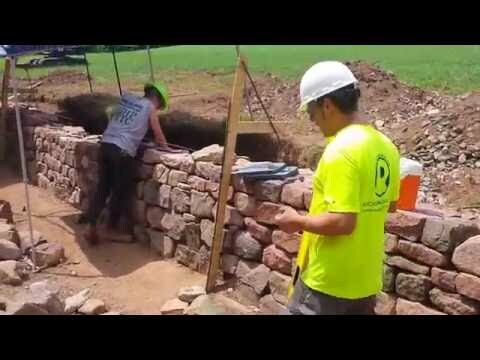 If you have a rectangle you would use the longest face of the stone when building with mortar. For dry laid stone contractions you always place your length into the wall for strength. Normally most of the pallets I buy allow me to build about 20 SQFF Square Face Feet of front wall. This project is 115 SQFF of wall divided by 20 (SQFF) gets me 6 pallets of stone needed. Just to be safe we'll consider the back of the wall now so lets add 3 more = 9 pallets so heck 10 should be more then enough right? Now how will we get more? 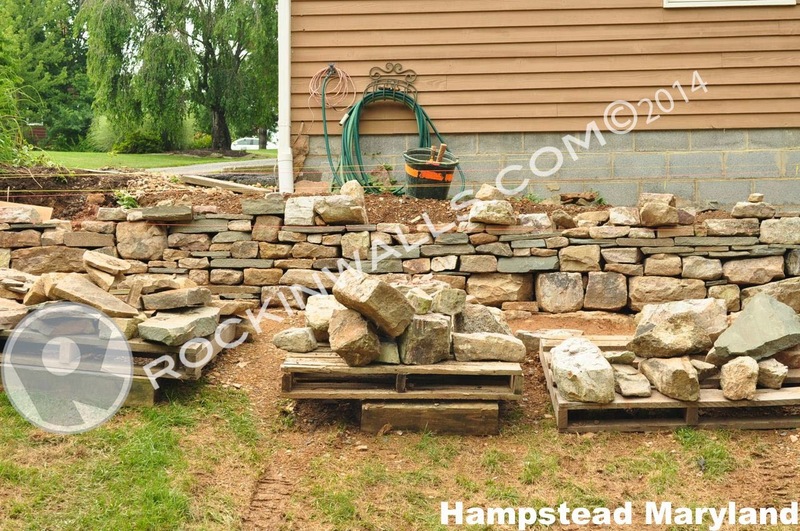 Since this is not local stone it makes it hard to bring in just a few more pallets to make up any extra needed or say we need to ad a few more projects to the property???. How will we match it??? The other issue I've been having is that most of the stone is either to large ie machine moving size or soft ball size. Not having the right ingredients can make it hard. (keep in mind each project just like cooking calls for different ingrenents) I learned early its best to have to much of the right stone not to much of the wrong stone. (once again based on the stone application or job, project) All stone should have a job if you feel its right for the job. Stone should be one man movable not machine size - unless. 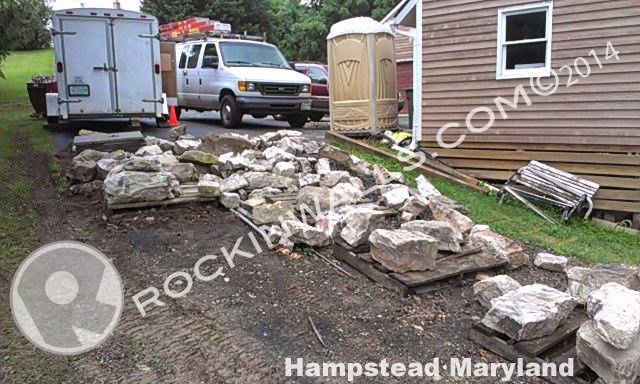 (unless the job requires and calls for larger stones) My remedy to help solve the problem on this job is to bring in some more stone that is local to mix in. 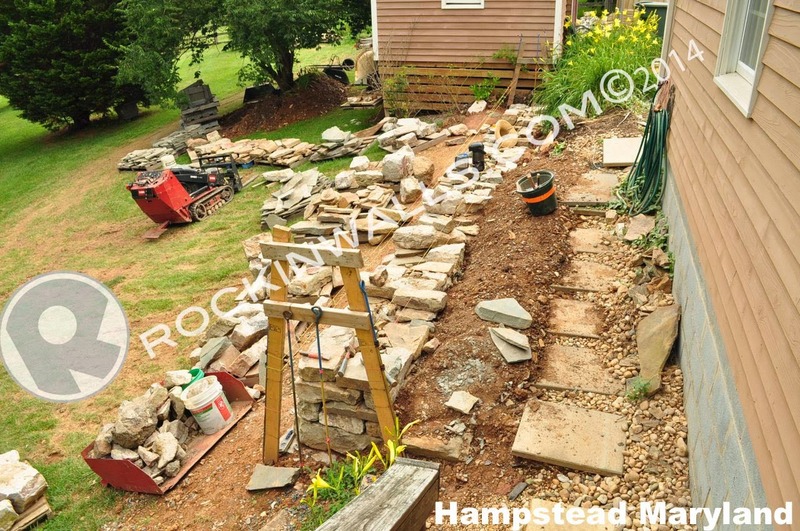 I needed some 1"- 4" thick stones, (helping me fill the gaps on what was missing on the pallets - and expiditing my build time but also insuring the most important fact - structual intergraty) blue stone was agreed apone since I would be using larger PA colonial blue for the flat cap stones. As seen below the blues mix well with the white tans. Plan ahead - picking the correct ingredients and following your receipt.